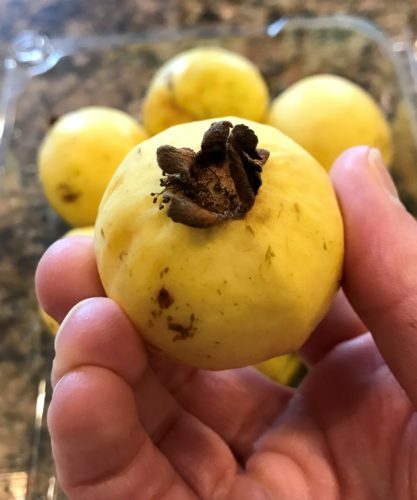 As I walked through the produce section this week, the guavas literally drew me over to them. They smelled so fragrant I just knew I had to make some sort of guava dish. 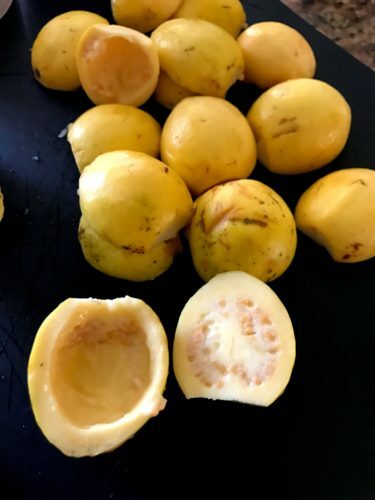 Guavas come in all shapes and sizes, but these Mexican cream guavas are about the size of a golf ball and yellow in color, such that my daughter asked if they were “banana balls”. To highlight the guava flavor I decided to make a strawberry and guava compote. Once the flower (the end) is removed, you half and deseed the guava. The seeds are actually edible, but more of an acquired taste so I removed them from this recipe. The guava and strawberries are cooked for a few minutes in a spiced syrup, which is all they need to make a delicious compote. 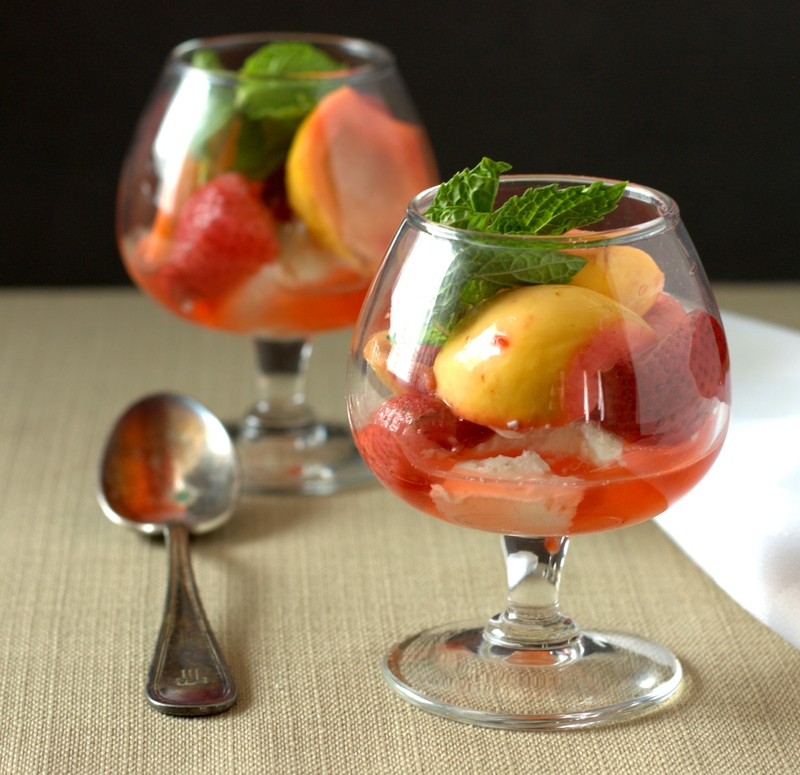 The sweet guava compote is the perfect complement to a touch of mascarpone and mint. 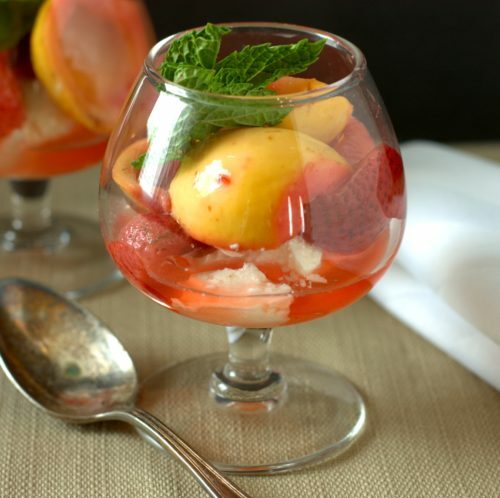 The resulting dish is stunning, yet an easy and elegant dessert for Mother’s day, baby shower, or other festive gathering. Add the water, sugar, lemon juice, cinnamon, and cloves to a large sauce pan. Heat over medium heat, and bring to a boil. Reduce the heat to simmer, and simmer for about 10 minutes or until syrup begins to thicken. While the syrup simmers, wash the guava and then remove the flower end from the guava. Next cut them in half and scoop out the seeds (reserve for another use, if desired). Remove the stems from the strawberries and cut in half. Add the guava and strawberries to the syrup and cook for 3 minutes. 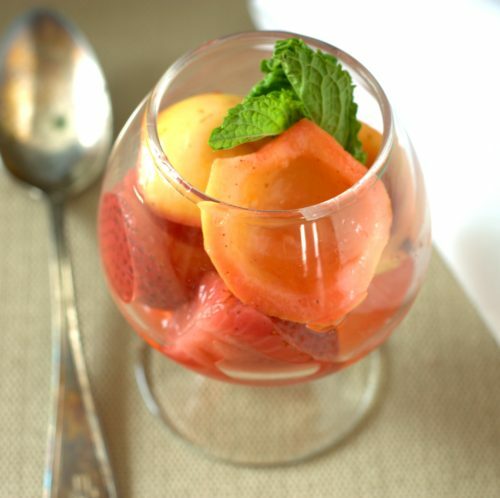 Remove from the heat, transfer the fruit and syrup to a large bowl, cover and refrigerate for at least 1 hour. To serve, place one ounce of mascarpone cheese in the bottom of a serving bowl or glass. Evenly divide the fruit over the eight bowls, then drizzle with some of the syrup (there will be some syrup left in reserve). Garnish with mint and serve. This entry was posted in Dessert, Party and tagged cheese, guava, strawberries.